We found out first hand this week that goodbye’s are a little hard as you leave people you have grown to love and know that you may never see them again at least in this life. No, we are not coming home yet, but Charles Briga leaves for Congo in the morning and we had to come to Lome last Friday, so we went by to tell him goodbye and good luck. We have talked about the family before. He and his wife are both in the military. She left for Cote d’Ivoire 3 or 4 weeks ago. Both will be gone for 6 months on UN peacekeeping missions so they won’t be back until after we leave for home. Brother Charles is my Angouleme brother. He started out in the military to be a pilot and went to France for training where he got in contact with the missionaries and joined the Church. For a period of time, he attended the Angouleme Branch where I started my mission many years ago and where I worked for about 15 months. He was washed out as a pilot and ended up in avionics so he now fixes radio equipment for the military. They do not necessarily enjoy the military but it is a job in a country where jobs are difficult to find so they do what they have to do. Their two little girls, Maelle and Myla will be staying with Charles’ brother and his wife while they are away. We will probably get to see the girls again a time or two before we leave. Helene was baptized in April as we wrote about before so they are looking forward to going to the temple and having their little family sealed about May of next year. 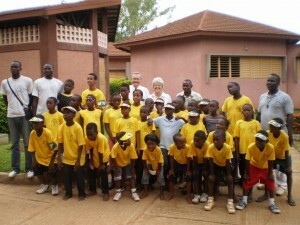 What fun it would be to come back to Ghana and be there for that. About three weeks ago, Frere Samba, the Elders quorum president in the Gbedjromede Branch, came to us and expressed a desire to do a service project for the orphanage in Calavie. We wanted to go there and see what the situation is for the kids, so on Wednesday we took him and Soeur Precious to Calavie. 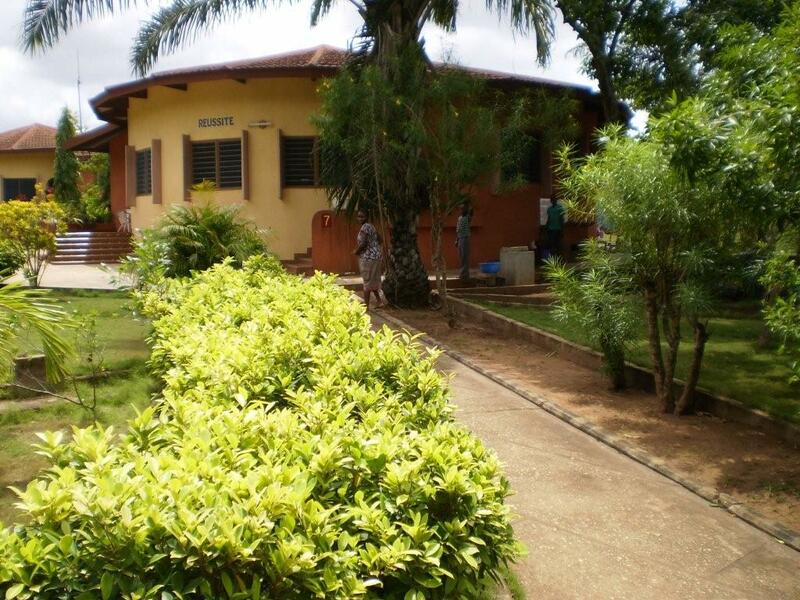 The orphanage is funded by a world organization called SOS which was started by an Austrian in the 1930′s. Much to our surprise it is a very well organized method of caring for the kids. There are 92 children there at the present time and they are all organized into family homes of about 10 children in each home with an adult “mother” who lives there full time assisted by several “aunts” who come in each day. The homes are clean and adequately furnished. There is also a large school for the children which is also open to community members for a tuition fee. The kids all seemed to be well cared for and happy. We met a sports coach at the cafeteria who arranged for some of the kids to have their picture taken with us. They had just finished an “end of school” celebration and all had on tee shirts that they received for the sports competitions. The yards are well maintained and absolutely beautiful. The kids in this orphanage are the most blessed kids in all of Benin! While in Calavie we also went over to visit Soeur Julianne. We need to have Precious or Nadia when we go for a visit with Julianne as she is deaf and only reads Fon lips. Frere Samba is from Congo so there are no Fon words from him either. We always enjoy our visits with her. Last year the old Cotonou branch organized a mini Bishop’s Storehouse for needy members. This was a great blessing to the members and after the branch was divided a blessing to all of the branch presidents as well. 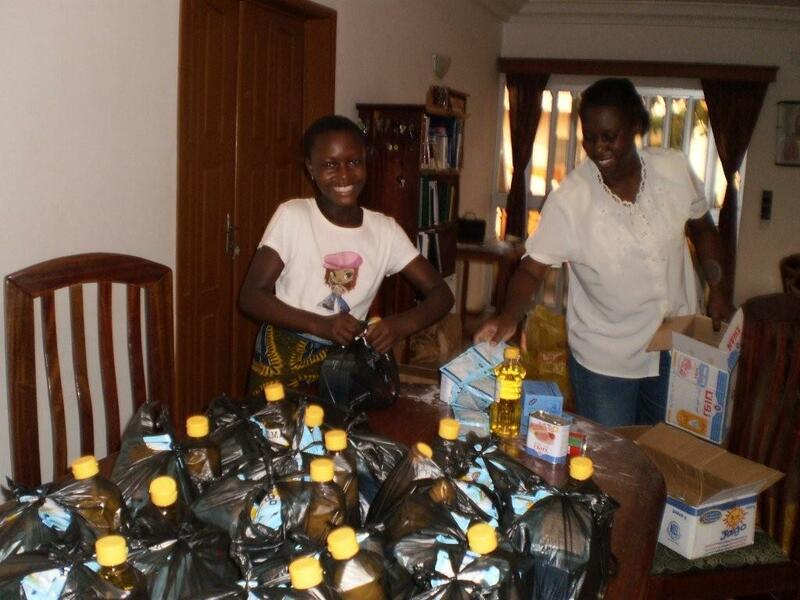 We started with 24 sacks of commodities containing rice, powdered milk, sugar, oil, tomato paste and corned beef. Several weeks ago all of the sacks had been distributed so we decided to once again get sacks filled to continue with the program. 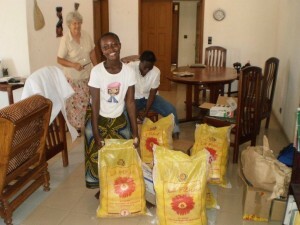 We picked up Soeur Felecite, the Relief Society president, and her daughter Lilliane and went to Missebo Marche to get a new supply of commodities. That is quite the experience as first of all, you need to know where to go for each thing and then be able to bargain for the best price all the while being surrounded by people, people everywhere, horns honking and heads carrying everything imaginable for sale. We stayed in the pick-up as a white face is no help at all in the bargaining process! After all was purchased we went to our apartment and filled the sacks. 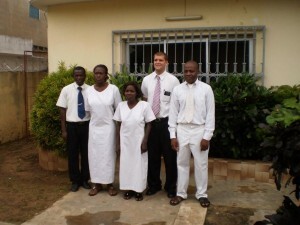 Soeur Black has completed all of the baptismal clothing now for Lome. The baptisms have taken on a much better appearance as the candidates look very nice for their baptisms. We included a couple of pictures just to show off the new clothing. 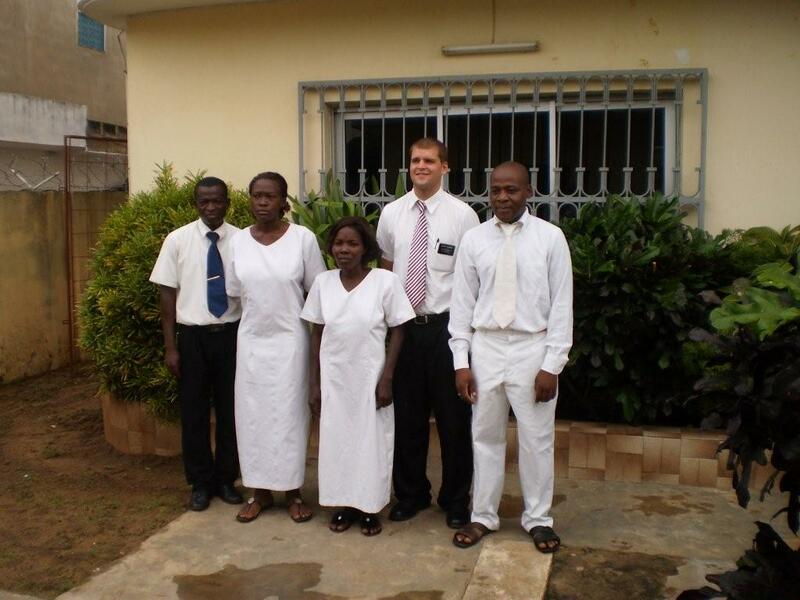 In the one with Elder Bowman and Kouakou, the Branch mission leader is doing the baptism and the persons baptized are his wife and his sister. These are the kinds of baptisms we like to see as another family is progressing eternally in the gospel. You may remember the little boy who was sleeping during Branch conference. We sent a picture of him in our blog a few weeks ago. 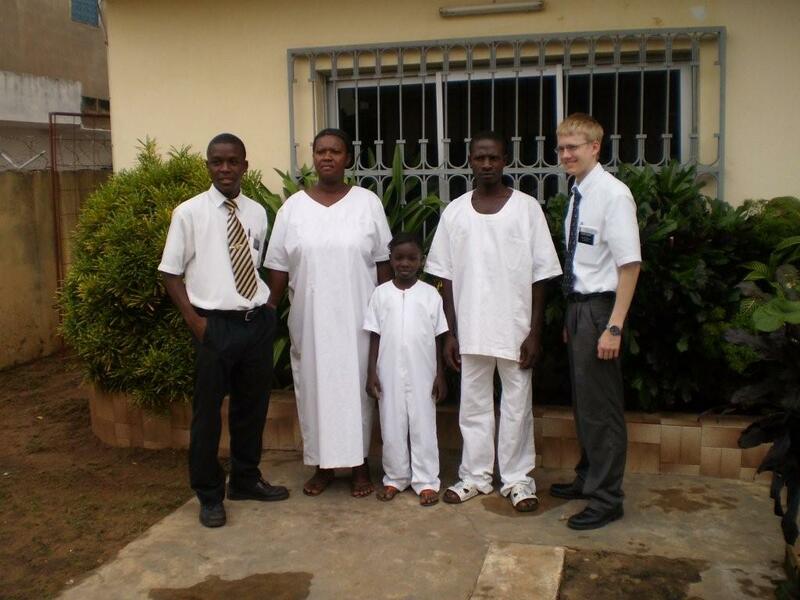 He is the son of this mission leader and his wife. The rainy season continues in force and along with the rain the temperatures are much cooler. In fact, we have needed a sheet over us every night for the past week. (The other night Soeur Black even got cold.) It sure does feel good but the natives are complaining about it being cold. A good old snow storm would wipe these people out! The rain does not help the road situation out, though. 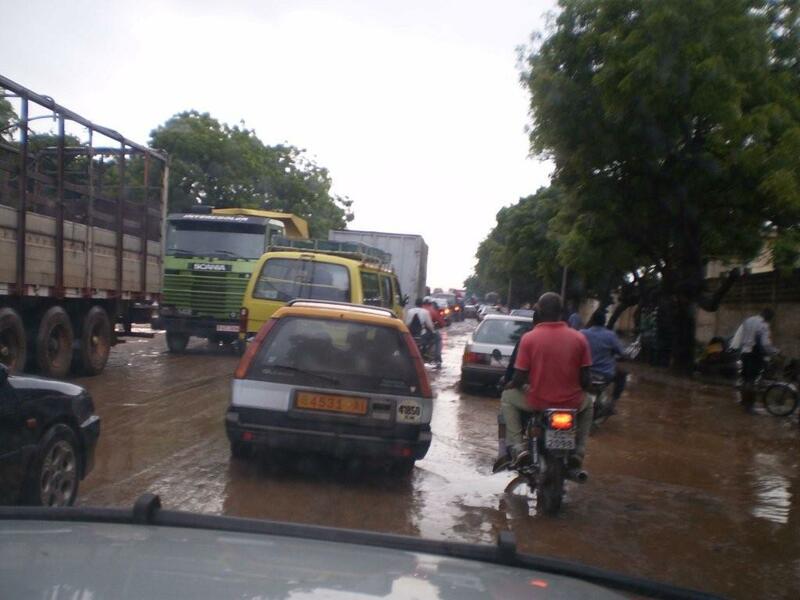 It rained continually from the time we left Cotonou until we arrived in Lome this week so the pick-up looked like we had been mud bogging in San Juan County by the time we got to Lome. Elder Gillis said a real dirty pick-up was “badge of honor” as it showed we were out there working in the Lord’s army. This entry was posted in Uncategorized by Elder and Sister Black. Bookmark the permalink.